Works right out of the box! Just sign in! Saves you time one-click functionality! A single click directly from your inbox saves emails straight to your Dropbox. Just click here, click the Add to Chrome button, give permission on your email, and you’re ready to go. Save Emails With One Click! 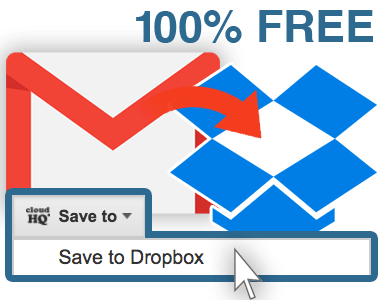 Whether you want to free up space in your inbox, or just increase security by having a backup, saving your emails to Dropbox is easy! Just click the Save To dropdown on any email, and select Dropbox to keep a permanent PDF record of your emails. A free plan is available for anyone with a Gmail account or a business email that’s hosted by G Suite.